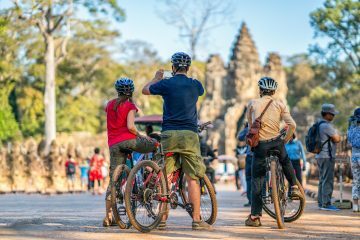 The trip can be started in Phnom Penh or Siem Reap, where the mountain bikes have been prepared. Our cycling guide will brief on the tour. Getting around and out of Phnom Penh is a busy traffic. We ride approximately 320 km mostly on tarmac roads on most of the days except from Banteay Srei to Kbal Spean which is about 15km on the dirt road. 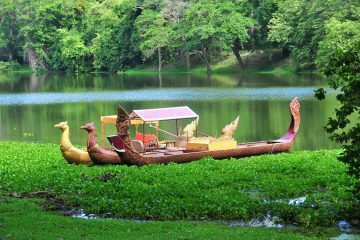 Apart from Angkor complex, the other main interest are Kbal Spean known as the river of thousand lingas and Beng Mealea and Kompong Phluk. + Trekking and camping in the area of Kulen Mount. You will be warmly welcome and greeted by our tour guide and transfer to hotel. 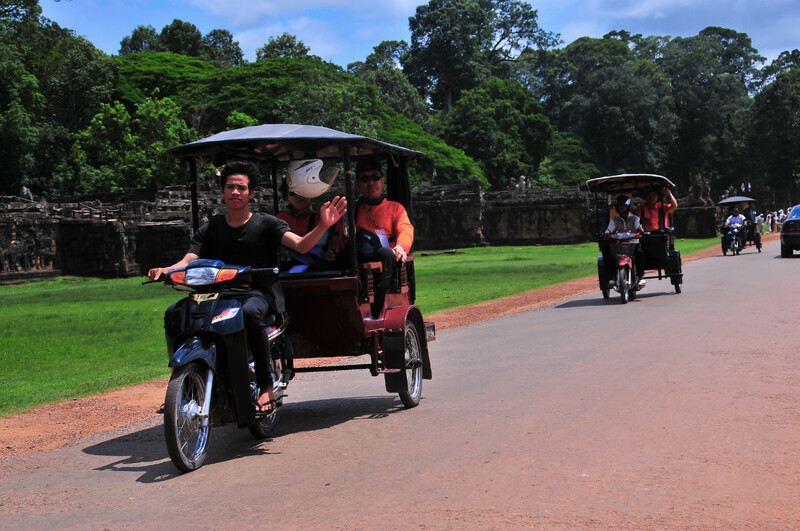 After check in, you will be taken by Tuk Tuk, a small open-sided taxi common in Cambodia. 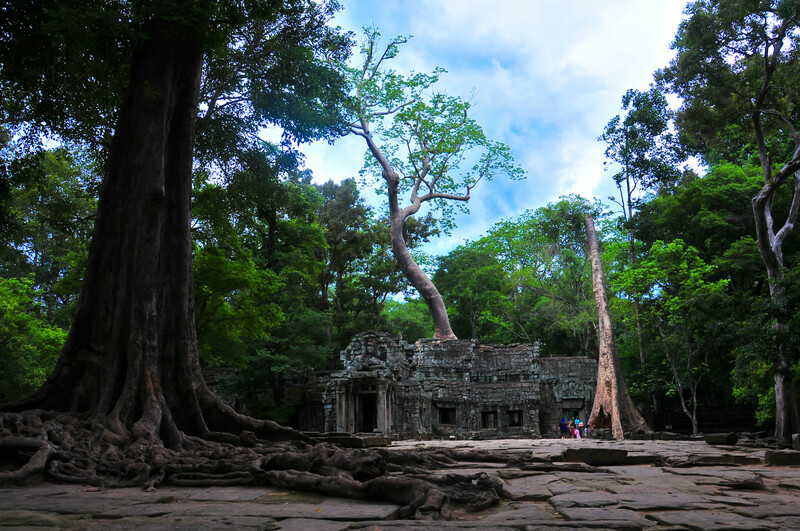 The pre-orientation of Siem Reap will be conducted at Preah Ang Chek Preah Ang Chom, where is the holy place for worship at every religious day that Cambodian consider as important part of their life and continue to Wat Bo, a large, highly respected pagoda, founded in the 18th Century. Like the Silver Pagoda in Phnom Penh, the vihear of Wat Bo contains unique wall paintings of the Reamker that are said to be late 19th Century. Look for the daily-life market scenes such as an opium smoking Chinese merchant, the colonial era French officer at the market and the French soldiers attending a traditional dance performance. Also of interest is the large collection of Buddha statues located behind the main Buddha and cruise around the suburb of Siem Reap town. Here you will have a blessing ceremony by Buddhist monks for happiness, prosperity and safety for your journey. 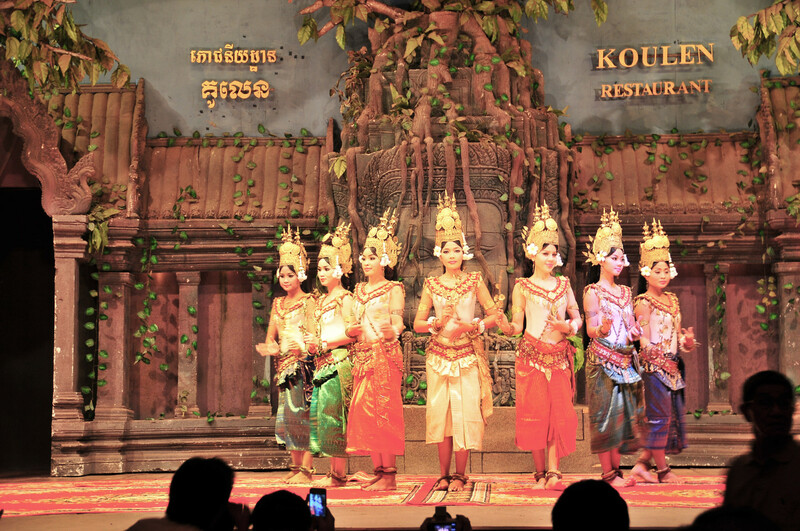 Tonight we enjoy buffet dinner with Apsara dance performance at local restaurant. Breakfast at hotel. 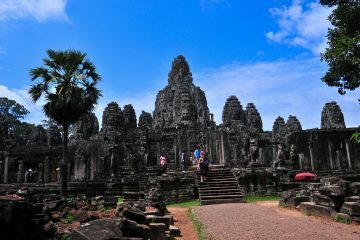 This morning we cycle to the archeological area, visit the most famous of all the temples on the plain of Angkor: Angkor Wat. Continue to Ta Prom Temple then cycle through the villages and lunch at local restaurant. Afternoon, continue your visits to Neak Pean, a fountain built in the middle of a pool and representing the paradisiacal Himalayan mountain-lake, Preah Khan temple. 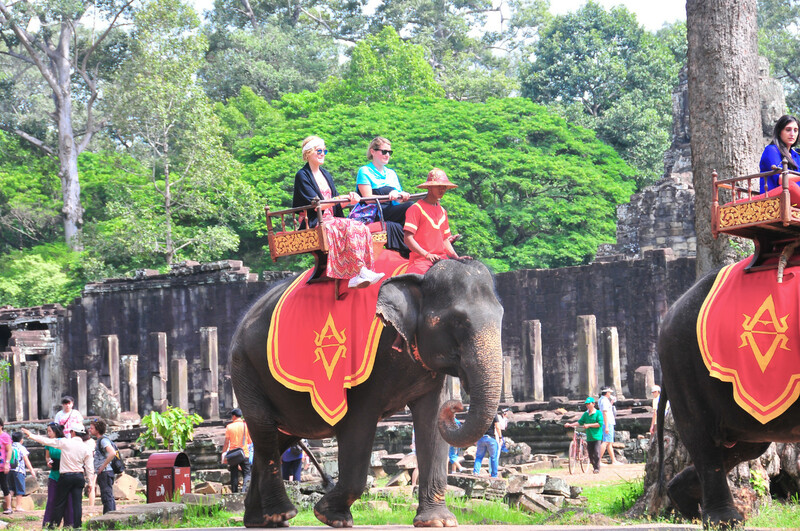 Visit the North Gate of Angkor Thom, Elephant Terrance and Bayon temple, (unique for its 54 towers decorated with over 200 smiling faces of Avolokitesvara) until sunset. Come back to Siem Reap town and overnight at hotel. Breakfast at hotel. This morning, we start our tour to countryside on road to Phnom Kulen Mountain which is 57km from town. You will be dropped off at the foot of the mountain called Preah Ang Chup where you will start your adventurous journey trekking up the mountain into the jungle. Within the 08km trekking, you will discover the hidden beauty of the nature on this mountain. After about 02 hours trekking, you will reach 1000 linga river, Reclining Buddha and enjoy swimming at the waterfall. Lunch will be provided as packed-lunch by the waterfall. We spend the rest of the day walking in the village where you will have homestay with the local people. After breakfast arranged by local, we continue another 13km trekking through 02 villages, Phum Preah Ang Thom and Phum Thmey before arriving to Wat Preah Kral Pagoda where you will overnight in camp in the monastery. While passing through the villages, you will be able to take chance to participate the community development activities to the real needed villagers. Tonight we will have a 45-minutes meditation course by the monk. After breakfast, we start another day of trekking. We start to trek to Bat Cave then continue to visit Srah Damrei, Aram Rongchen temple, Domrei Krab temple and Peiy Chen. Take-away lunch will be provided here. After break for lunch, we continue another 2 hours and half trekking to Ta Penh Village where you will spend one-night camping. This is the very good place for sunrise the next morning from Peuy Wat Chas. Early wake up for sunrise view from the mountain. Breakfast at the camping site. Today is the last day of trekking down to another side of the mountain to Svay Leu Village. Along the way of this last trekking, you will find out few villages, rice fields, rivers and farms on the mountain. Once you reach the foot of the mountain, we will drive back to Siem Reap. Breakfast at hotel. 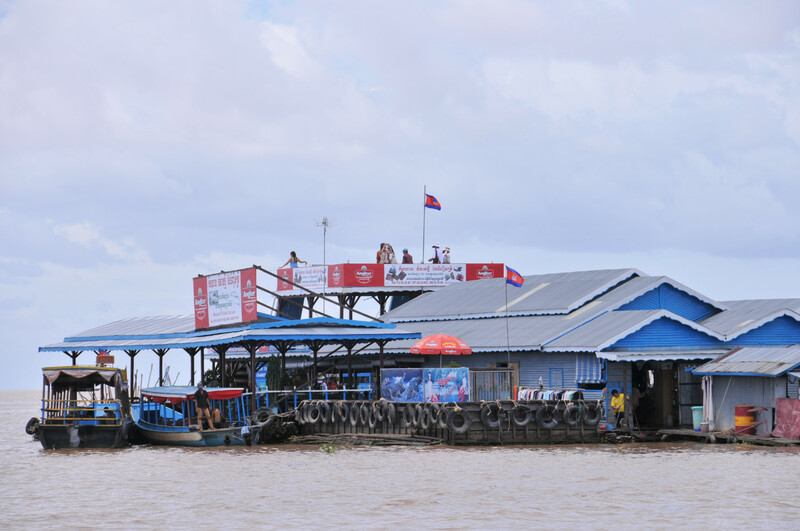 We visit the floating village of Chong Khneas, located 10 kilometers south of Siem Reap. 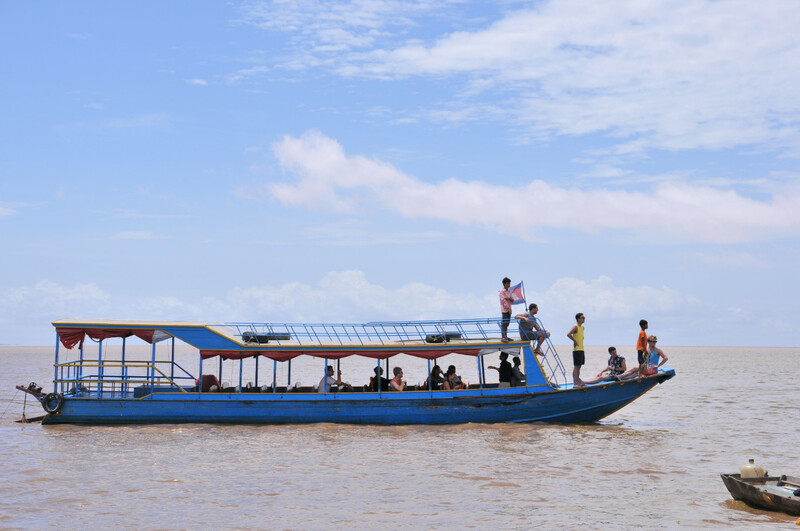 We take a boat trip in a traditional wooden boat on the Tonle Sap Lake, the “Great Lake” of Cambodia, one of the largest in Asia. 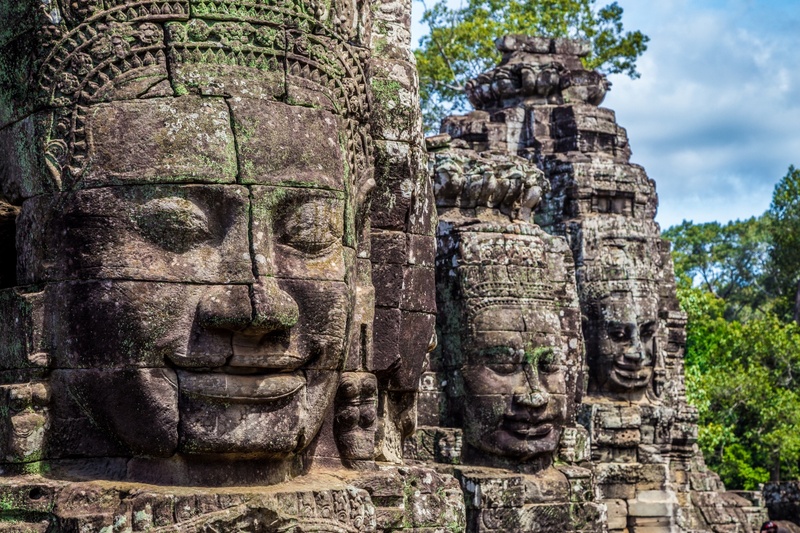 We spend the rest of day visiting the “Chantiers Ecoles – Les Artisans d’Angkor” which provides training to young Cambodians in an effort to revive the ancient Khmer traditions of stone carving and wood sculpting. Free at your own leisure till departure transfer to airport.